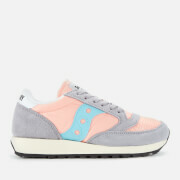 Women’s two-toned, low-top ‘DXN Vintage’ trainers from Saucony. 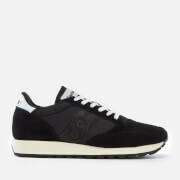 Constructed with uppers that combine nylon, suede and mesh panels, the sneakers feature a round toe and lace up fastening with flat, tonal laces and punched eyelets. Set on a shock-absorbing EVA midsole with a durable rubber traction overlay for grip, the lace-ups are detailed with a supportive padded collar, a woven brand label stitched to the unlined tongue and discreet tonal branding at the heel. Finished with a removable insole. Upper: Leather/Textile. Midsole: EVA. Sole: Rubber.